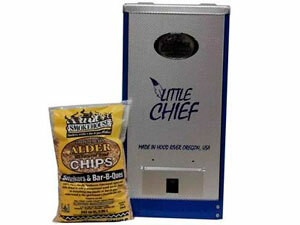 The Smokhouse Little Chief Front Load Smoker is specifically designed to perform smoking jobs. It is packed with tremendous features that allow its users to enjoy their experience in preparing different kinds of smoked foods. The smoker has an easy-slide chrome plated grills and its structure is durably made from embossed aluminum construction. Ventilation was also properly designed to promote proper dehydration. The heat is fixed at 165 degrees Fahrenheit to ensure consistent heating fit for smoking jobs. Fabulous inclusions await when you purchase this smoker, such as the recipe booklets and manuals, 1.75-pound bag filled with natural wood chips, and a 2-year warranty. Simply marvelous! This smoker is designed with durability that it lasts as long as twenty five years without any problems encountered. The shelves that go with it simply allow multiple smoking jobs at one time. Ideally for outdoor use, it is compact and easy to handle and store. The wooden chips are also available anywhere that you can purchase it right then and there. The smoker gives off consistent smoke that produces perfectly smoked foods with its tender texture and sumptuous flavor. It works well even if it is frequently used for years. You will also surely enjoy the recipe and guide booklets that will be with you to give you simple directions on how to start with the whole thing. The quality of the smoker pays off its cost. The fixed temperature of this smoker was found to be not working well especially when the temperature of the environment is low and in some cases when it is windy. It requires a lot of time, for instance around 8 hours to smoke a thin sliced fish. When smoking meat, it cannot handle large and thick cuts. However it works well only during summer and that’s it. The compact and lightweight design does not adhere to heavy duty jobs like other smokers do. The aluminum sheets used in the construction of the smoker gets easily dented. It is actually a feeble kind of smoker.